Easygel® uses a special pre-sterilized bottle of growth media and plates which makes it easy to inoculate without sterilization equipment. EasyGel has pre-sterilized growth media and petri dishes that are ready for your students as you need them for your classroom experiments. There is no fuss and bother. Just pour the Easygel® into the pre-treated plate and get a sterile gel in 45 minutes! 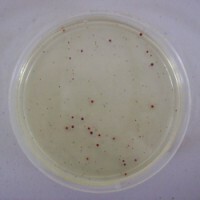 The chemical in Easygel® stains colonies red as they grow, making them easy to identify and count! Outstanding for science fair projects, homeschool, classrooms or as a gift for your fledgling young scientist! The Surface and water kit is for testing bacteria on any surface: hands, after hand sanitizer, disinfectant, etc. 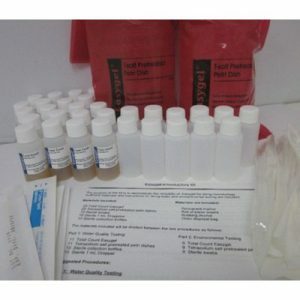 Antibiotics can be used to test the bacteria also; it can also be used to test water such as fountain water and puddles. This is a wonderful introductory kit to microbiology. It contains sterile cotton swabs that can be used to swipe any solid surface. 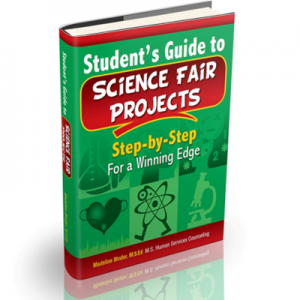 The comprehensive instructions lead you to 100s of possible experiments that you can have fun with or do for your science fair. Amazing technology gives you the ability to count how many bacteria are on a surface by counting the red dots on your petri dish … so safe and easy to use! The pre-sterilized growth petri dishes and media are all ready for you to use at any time. There are HUNDREDs of Possible Experiments…. Is there more bacteria in the water that comes out of the drinking fountain in your classroom than there is at home from your kitchen sink? How cold does your refrigerator need to be to prevent spoilage? Unsafe growth of bacteria? Does your refrigerator prevent beastly microbes from growing on your food? Which surface of your kitchen and / or bathroom contains the most bacteria? Are you going to be surprised? Take an educated guess. How long can meat, vegetables, or fruit stay in the refrigerator before it has unhealthy levels of bacteria? Find out what the food quality and safety is for refrigerated food. Which mammals have a higher concentration of bacteria inside their mouth? Humans, dogs, or cats? Find out which surface disinfectants kill bacteria best. Did you know that healthy soil is full of microorganisms while dead soil has less? Compare the number of organisms that exist inside an equal weight of fertile garden soil, hardpan, and playground sand. Compare the bacteria in water from a faucet in your home to the amount of bacteria that is in the water from your garden hose. ~ How long do the tests take to show results? 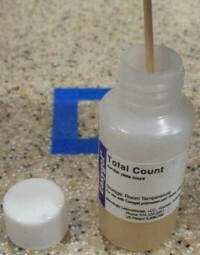 The bacteria will grow in two days at room temperature or 1 day if grown in an incubator at 95F. Ages 10 and up. Adult supervision recommended.